One Actual Use for Children’s Artwork | Laura's "Rules"
My daughter churns out artwork like she’s competing in a toddler Olympics event called Synchronized Scribbling. I chuck the stuff to which she’s most attached into a large portfolio for future historians to study. If all goes well (i.e., so long as I’ve chosen art she is ready to, er, re-gift) it also seems to add to her pride in gift-giving. With this, I’m basically set for life on gift-wrap, which is just fine with me, as giftwrap is about as single-use and pointless as it gets. Please forward through the interwebs as you like — maybe we can even start a movement. Moms for upcycled child artwork, or something. 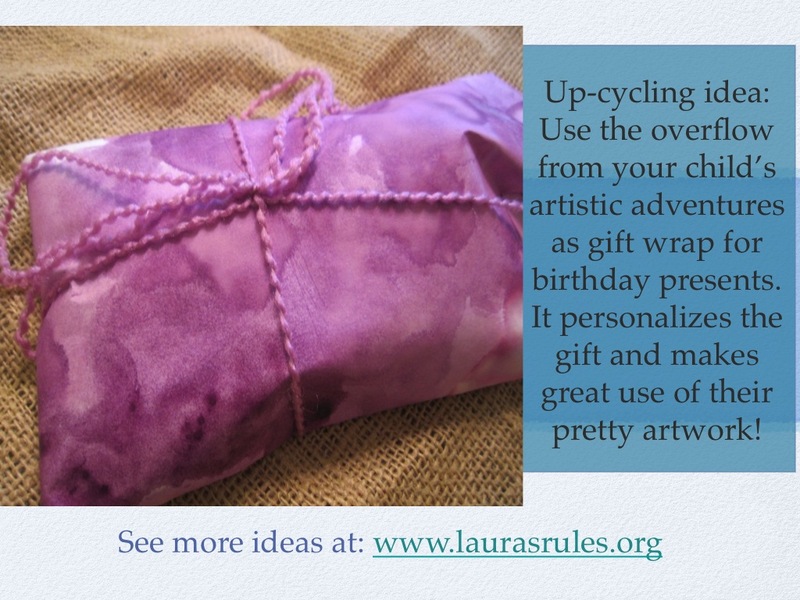 If you are determined to do something more elegant but still eco-friendly, you might consider using furoshiki, or Japanese wrapping cloth, which gift receivers can always reuse. And here’s anti-plastic crusader Beth Terry’s post on wrapping gifts without plastic or glue. This entry was posted in Recipes & DIY and tagged art, artwork, attractive, beautiful, birthday, card, Child, children, craft, crafty, crayon, DIY, drawing, easy, eco-, environmental, gift, Gift Wrap, Gift wrapping, Gifts and Occasions, green, Holiday, Home, ideas, mommy blog, overflow, painting, Paper, parenting, personal, personalize, present, recycle, resuse, simple, tips, toddler, up-cycle, upcycle, use by Laura MacCleery. Bookmark the permalink.